Splinter Soldiers arrive to battle the Goblin menace! 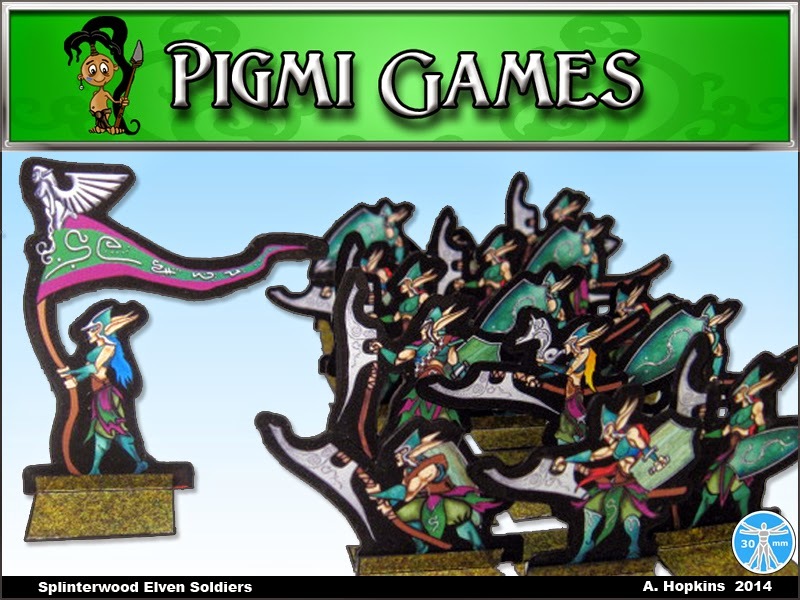 Pigmi Games presents a set of 16 Elven foot-soldiers armed with great-axes and shields. Comes complete with standard bearer, trumpeter, and champion. Hello and welcome to the 2014 Papercuts Showcase! How to play: Make stuff out of paper, take a picture, start a thread in the appropriate part of the Papercuts Showcase boards. Post your picture and a download of the model or miniature. Discuss and enjoy. Original works only. Entries submitted in previous Papercuts are not acceptable. Forum Hoard submissions that have not been entered into a previous Papercuts competition are acceptable. The submission deadline for this year is Monday September 1st, 2014. 1) Best Single Figure - The design must be original. Three pictures maximum to show off your work, download required. 2) Best Multi-figure - A group of figures. All figures must be original design. Three pictures maximum to show off your work, download required. 3) Best Model kit - terrain, vehicle, building- what have you, a multi-piece kit. Original designs only. Three pictures maximum to show off your work, download required. 4) Papercraft in Action - A pure paper diorama scenic category. Models and miniatures can be from any published or original source. Three pictures maximum to show off your work, no download required. 5) Mixed Media Presentation - Papercraft must feature prominently in this categories entries, but can also feature elements from other mediums; metal or resin minis and models for example. Three pictures maximum to show off your work, no download required. 6) BEST IN SHOW - The one entry that says Papercuts 2014 to you. This category will be assembled from all of the other entries in the other categories. Prizes will be in the form of gift-certificates to One Book Shelf. Amounts to be determined. Submissions will be in the form of photographs of your figures and models as well as a free download of the entry. I recommend services such as Dropbox for the download and for the image hosting. Create a new submission between now and the deadline; 09/01/2014. Photography is a factor due to the fact that if we can't see it well, it will affect the scoring. Modifying the presentation image for lighting and sharpness is acceptable, just don't add embellishments to the presentatin picture that are not present in the finished model or miniature. Likewise make sure it is easy to download your model or miniature submission. Rules of entry subject to change. Check back periodically for updates. Have fun with creating your submissions, and Good Luck!